We have some catching up to do, so what better way to do it than a very special Supernatural FiveByFive review! This is where we take a look at the five episodes leading up to the midseason cliffhanger: episodes 5.05 Dog Dean Afternoon, 5.06 Heaven Can’t Wait, 5.07 Bad Boys, 5.08 Rock and a Hard Place, and 5.09 Holy Terror. There’s a lot of ground to cover, so get started reading or cherry pick the reviews you’re interested in. Episodes 5.05, 5.06 and 5.07 are in this first part. Go! First off, I have to say I loved getting yet another Game of Thrones reference at the beginning of the episode – and through taxidermy, no less! Plus there was a Sharktopus and Breaking Bad nod later in the episode as well. And yes, I loved seeing Dean getting in touch with his canine side (fetching, scratching and barking at the mailman – priceless). But, I can’t say I loved how the talking animals were presented (although Leslie Jordan voicing the Yorkie was cute). And Dean checking out the poodle just did not work for me. What did work for me was the idea of a chef turned shaman trying to make himself into a “super being” by ingesting the organs of different animals and taking on their superior qualities and strengths. The episode also provided Sam with yet another clue to his inner travel companion. When Chef Leo (Steve Valentine) says to Sam, “I want to know what you are,” after Zeke miraculously heals Sam’s slashed throat, Sam should know that something is amiss. Let’s face it, the last time he was asked, “What are you?” it turned out he was missing a soul. But, even though Sam is bothered by the crazy chef’s question, Dean’s smooth lies assuage his doubts and fear. Oh, what is happening to the brothers Winchester. Exiled from the bunker (heartbreakingly, at Dean’s request), Castiel has found a place to live and work, safely hidden from the angels that are hunting him. It’s at an Idaho Gas ‘n’ Sip, but hey, you take what you can get. On the surface, his attempts to emulate human existence are comical, but there is a melancholy beneath it all that suggests our favorite angel is a lot more lonely and lost than he lets on. When Cas accompanies Dean to the latest “pink” crime scene, he realizes that the culprit is an angel of mercy, drawn to people’s pain and releasing them from that pain by vaporizing them. Dean wants to pursue the angel, but Castiel is afraid — he is human now, no longer endowed with angel’s power. Dean sees the fear and decides to finish the case on his own. By the time Dean drops off Cas for his “date” with Nora, the façade of a happy, content life is almost back in place. Dean gives Cas some halfhearted dating advice and sends him off like a parent watching their child going off to their first day of school. And, after all of that preparation, we totally feel Cas’ disappointment when he finds out that Nora just wants him to babysit while she goes out on a date. Oh, and Castiel singing the theme from The Greatest American Hero to the crying baby is just priceless. The awkwardness and off tune vocals were hilarious (especially considering that Misha Collins has two toddlers at home). As he talks to the baby, calming her down, the parallels between them are clear: they are both newborns in this world. Lost, confused and overwhelmed with feelings they don’t understand and floundering between joy and sadness. Meanwhile, Dean has found out the human identity that the Angel of Mercy, Ephraim (Ashton Holmes) has taken on and that he is at Nora’s house. 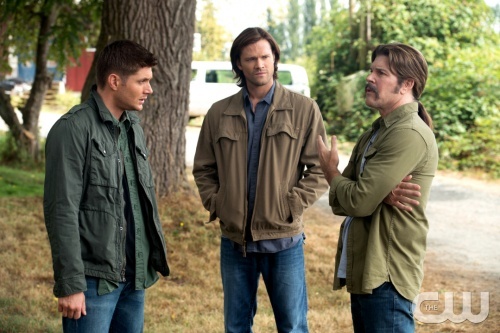 When Ephraim confronts Cas, his first instinct is to protect the baby. The truth, though, is that it is Castiel’s pain that has called out to Ephraim and he is there to release Cas from his misery. In their exchange we see that Ephraim is also childlike in his inability to reason outside of his limited encounters with human suffering. Like a child, everything is black and white to him – there is pain and suffering and it is his mission to vanquish it. He doesn’t understand the human struggle or the will to live or the concept of hope. 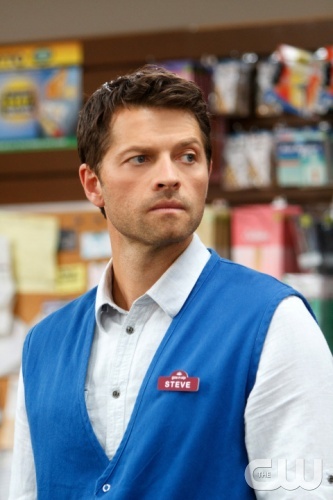 With Dean’s help, Cas defeats Ephraim, but the encounter leaves him wondering if he is abandoning his mission to help the other fallen angels on earth. 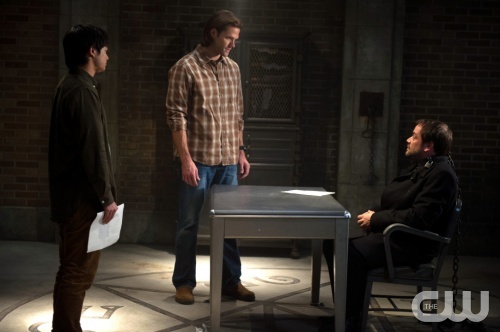 Back at the bunker, Sam and Kevin, with the help of Crowley, have learned that Metatron’s spell, casting the angels out of heaven, is irreversible. Crowley has also learned that the threat of Abaddon is even greater than he thought. He is not a happy camper. Sam also witnesses Crowley injecting his blood from a discarded syringe. Is Crowley still harboring some of the humanity that he exhibited during the ”exorcism” of last season? Is he trying to hold onto that humanity? Dean keeps the news about the spell being irreversible a secret from Castiel. Dean is getting quite good at these lies of omission. He finally apologizes for asking Cas to leave the bunker, though he tries to gloss it over by saying that he is proud of how Cas has adapted to his human life. As they say goodbye, the façade is back in place – everything is fine, all is well with the world. But, we all know that is just another lie. It’s interesting that Sam did not know that Dean had spent time in a Boy’s Home after getting nabbed for shoplifting food (to feed Sam) at the local market. Sam was told that Dean was lost on a hunt for a couple of months until his Dad found him. It comes as no surprise that the history of half-truths and lies of omission go back to their childhood. This story was started by their Dad and it just stuck. It’s also interesting that Dean says their Dad found him right away, but left him at the home because Dean lost their food money in a card game. Another jab at Papa Winchester being a hardass parent? Or perhaps he saw that Dean was safe and free of responsibility for awhile and let him be? I’d like to think it was the latter. As they investigate the farm, Sam finds signs of Dean’s past (a pentagram carved into a bedpost, an award for wrestling) and Dean finds memories that were long forgotten (including those of a girl named Robin, who Dean finds again at the local diner). Even though Dean was only at the boys’ home for a couple of months and he kept the family business a closely guarded secret, it is clear from his memories that Sonny was able to get to know Dean pretty well and his time spent there had a profound effect on him. In past episodes, we usually see Dean biting at the bit to keep moving – on to the next hunt – and always driven by his need to protect his little brother. Finally, we see another side of Dean, one that we usually associate with Sam. This is as close to a normal, carefree life as Dean Winchester has had since the yellow-eyed demon killed his mother and turned their lives upside down, and he is enjoying it. In the present, Dean befriends a timid young boy, Timmy (Sean Michael Kyer). Watching Dean with kids is always a joy since he has a knack for getting into their heads and knowing just how to reach them. When Sam connects the recent murders and accidents with people who have bullied or intimidated Timmy, he researches the boy’s past. It seems that Timmy has one helluva over-protective Mommy that even death can’t stop. And it turns out that Timmy is the real anchor keeping her on the earthly plane, so it is Timmy that has to release her from her ghostly vigil. But, Dean talks him through it and Timmy’s mother is able to move on. As the Winchesters leave the farm, now safe from ghosts, Sam realizes that Dean’s time at Sonny’s Home for Boys wasn’t the worst time in Dean’s life, but actually the best time. He asks Dean why he left and while Dean shrugs it off and claims the place just wasn’t right for him, we get one more bittersweet memory: the night of the big school dance – Dean’s first with his girlfriend, Robin. It’s also the night that John Winchester arrives to take his son back on the road, back to the hunting life. Sonny gives Dean the option to stay, but Dean stoically chooses to return to the fold. It’s a heart-breaking decision for Dean, but the sight of Sammy waiting in the backseat of the Impala makes his choice clear. 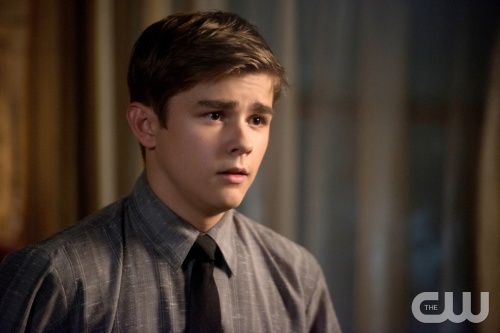 Dylan Everett gives a wonderful performance as young Dean, right down to the single tear on his right cheek as he says goodbye to Sonny. He transitions Dean from a cocky, troubled teenager to a responsible young man. What we don’t get to see in this episode is the reactions and motivations of John Winchester. It’s not hard to believe that he has been keeping a close eye on his son the entire time he was at the boys’ home. Did he choose that particular night to retrieve Dean on purpose? Maybe he knew that if Dean had experienced that one extra taste of a normal life, he never would have gotten his son back. Or maybe he knew it would have made Dean’s leaving just that more painful. 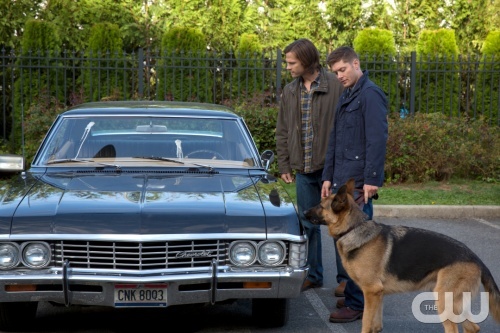 Would John have accepted Dean wanting to stay and hit the road again with Sammy in tow? Perhaps he would have even left Sam with Dean at Sonny’s. We’ll never know. But, I imagine that John responded to Dean’s decision with a mixture of relief and regret – he knew in heart that his son would always choose family. Look for Part 2 of this Supernatural FiveByFive Review coming up next! Castiel: “No, Dean. It’s not. Nora – she’s a very nice woman, I’m pretty sure she’s not a reaper intent on killing me, and she’s asked me out. Going on dates – that’s something humans do, right?